Each blog will explain the part of the body affected, how each lift affects that muscle group and recovery time. Each blog will be written in its simplest form so you, the reader, can fully understand the material. This week I will be discussing injury caused to the Cervical Spine and Neck. What is the structure and function of the cervical spine and neck? 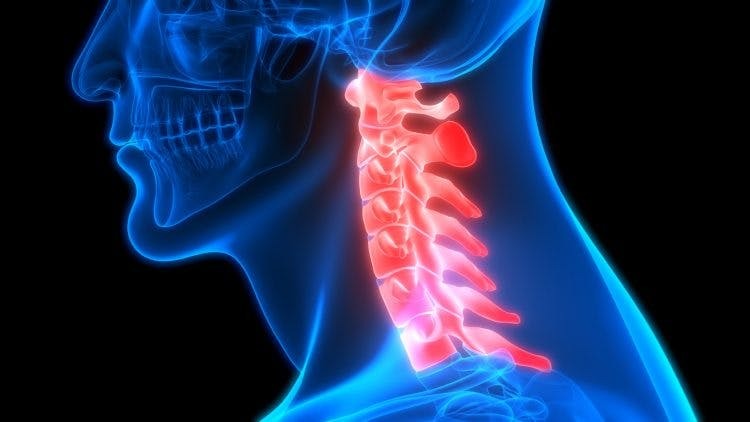 The cervical spine consists of seven vertebrae, (or small bones that form the backbone), support the skull, move the spine and protect the spinal cord. – healthline. Connective tissue called ligaments also help protect the spinal cords from further damage. Squats – Wrong placement of a bar on your upper back or neck can cause injury, bruising, or damage the spinal cord if the weight is too heavy. You can cause further injury if you force a movement against a heavy weight or a bar that is not placed correctly on your back. Ideally, no bar or weight should ever be placed directly on your neck. While squatting, leaning forward or backwards during a movement can cause neck injury, as well. It is advisable to practice technique with a low weight and then advance once you have mastered the technique and feel balanced and comfortable with your movement. Bench press – This lift requires use of chest, shoulder and lower neck muscles. Inadequate movement or a heavy weight can cause neck pain and injury. This case occurred while a patient with a history of cervical disc herniation was bench pressing 90 kg in supine position. Why did the disc herniation produce acute cervical SCI? Bench press exercise mainly strengthens the pectoral major muscle, shoulder muscles, biceps and triceps muscle; it involves no strong neck extension or flexion motion. One may not expect significant cervical muscle activity or injury to the cervical spine. We examined the superficial electromyography of the circumferential muscles of the neck during bench press exercise. Dead Lifts – Most of the cervical spine and neck injuries during this lift occur due to improper cervical spine; head and neck placement. Tingling sensation in the upper neck for arms are a good indicator of injury. A dead lift injury can be severe enough to cause injury and damage to the neck and shoulders. One way to avoid such an injury is to look at a fixed point ahead of the position where you are standing as this helps maintain the natural curvature of the spine. Another way to avoid injury is to self-myofascial release the upper traps. Self-myofascial release is simply a self-massage technique that can be done with a foam roll or ball massager. It helps relax contracted muscles and improves blood flow. This should be done if you are experiencing increased soreness during dead lifts. Military Press – The trapezius is a muscle that attaches to the neck and shoulder and helps stabilize the neck and upper back. During a press, this muscle takes the load of the weight. Damage or injury to this muscle can cause further damage to the neck and upper back since it is unstable and can’t support the neck and upper back. Moving too quickly or lifting way above capacity can certainly cause injury to the cervical spine and neck during a military press. Symptoms of cervical spine and neck injury include neck pain and stiffness, weakness or numbness running down your shoulder, arm and hand. In severe cases you might also experience muscle spasms. Heat might help. Others prefer icing the area. Over the counter pain relievers such as Tylenol or Motrin might help. If the injury is severe enough, the individual might need a neck brace to immobilize the neck and physical therapy. In conclusion, a cervical spine injury can be one of the most dangerous injuries any individual could suffer. Any of the C – spine fractures can leave someone as a quadriplegic or paraplegic. Both are devastating and take a lifetime of dependent care and medications. If you feel you have suffered a cervical spine injury or strain, please seek medical attention right away. Stop working out or you might make the injury worse.